Gatlinburg and Pigeon Forge, Tennessee are very popular destinations for church groups and other religious organizations. 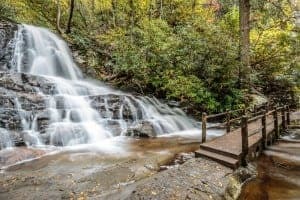 Located in the foothills of the Great Smoky Mountains, these charming cities provide the perfect backdrop for spiritual discovery and group bonding. To help you plan your trip, Aunt Bug’s has put together four tips for staying at our large cabins in Gatlinburg and Pigeon Forge. When you stay at our large cabins in Gatlinburg and Pigeon Forge, you will be just a short drive away from the most visited national park in the United States. Be sure to take advantage of your spectacular location by spending plenty of time in the Smokies. With breathtaking mountain views, idyllic streams, and unparalleled foliage and flowers (depending on the time of year), the majesty of the Great Smoky Mountains National Park is guaranteed to leave you in awe of God’s creation. The ideal religious retreat combines both group worship and quiet contemplation. Our large cabins are designed so guests can have togetherness when they want it, and privacy when they don’t. With spacious living rooms and plenty of seating, you’ll have everything you need to gather for group prayer. However, be sure to take some time to reflect on life’s big questions by yourself as well. Sitting outside on the deck to read a devotional or meditate is a great way to further your own spiritual growth. The incredible views of the mountains will help set the scene for some meaningful thoughts. While Gatlinburg and Pigeon Forge are home to some great restaurants, we recommend eating most of your meals right in your cabin. All of our properties come with fully furnished kitchens, so you can easily prepare a delicious feast for everyone to share. Cooking together in your cabin is a great bonding activity, and it will save your group a lot of money as well. There are a number of big supermarkets and local groceries in the area, so you can pick up everything you need on the way to your cabin. If your church group will be visiting sometime between May and October, you can stop by the Gatlinburg Farmers Market at 849 Glades Road. Running every Tuesday and Saturday morning, the Farmers Market is the perfect place to find locally grown produce and special treats, like jellies, jams, and baked goods. To start planning your religious retreat, check out our complete selection of large cabins in Gatlinburg and Pigeon Forge. If you have any questions about our properties, don’t hesitate to give our friendly staff a call!